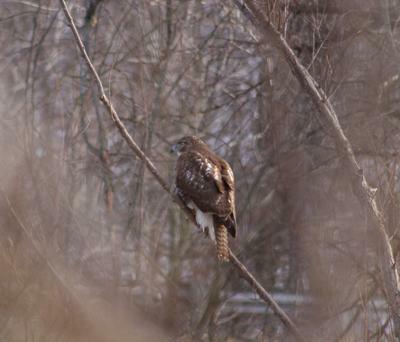 I saw this one in Crothers Woods (Don River valley) yesterday afternoon. I'm just a beginner, so I would love if someone could help me identify it. Perhaps one of our readers will be able to identify this bird from your great pictures. I will also post this on our facebook page. 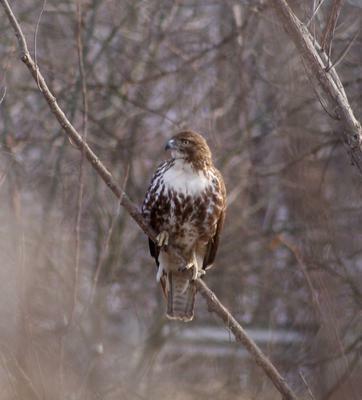 Definitely a Red Tailed Hawk, they are quite frequent nevertheless they are very beautiful birds. Loved your line "I'm just a beginner ". Great to have you with us. Lots to learn ahead of you and you'll enjoy every new species you identify and every habitat you visit. What you have there is a juvenile, Red-tailed Hawk. 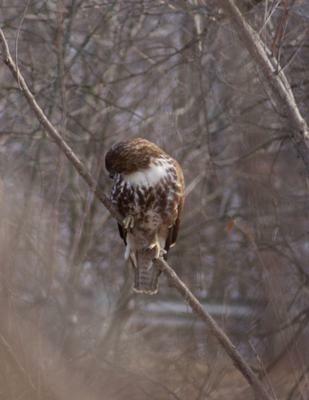 This looks like a juvenile Red-Tailed Hawk to me. Join in and write your own page! It's easy to do. How? Simply click here to return to Birds of Prey.